Reviews of some of the amazing kit we used during the Golden Arc Expedition, including items from Celtic Paddles, Hennessy Hammocks, Sea to Summit, Lomo, Kayalu, C-Tug by Railblaza, Imray Charts, Wavey Line Charts, Sea Bands, Shark Bandz, Falcon Sails and Extreme Foods. We will be paddling using Celtic Pro Sea and Touring Paddles, kindly offered by Celtic Paddles. The Celtic Pro range has been designed for the Intermediate to Advanced paddler who wants a light, strong paddle. Celtic Pro blades are a composite layup from the optimal balance of Carbon and glass composite layers with Carbon unidirectional reinforcing strips in key areas. The blades have been tested in the most extreme conditions and undergone continuous development to ensure you have the optimum balance of strength, weight and reliability. We were both paddling using Celtic's brilliant Pro 650 - Carbon composite Sea Touring blades on Straight carbon composite shafts fitted with adjustable Nylon Leverlok centre joints. In addition, carried 4 Piece paddles with 650 Nylon Blades as our emergency spares. Super lightweight, efficient and powerful. We were unbelievably impressed with these paddles from the beginning. For the travelling kayaker the four piece contruction allows the paddles to be broken down and slipped inside a bag or suitcase without forefeiting strength or durability. The nylon leverlock secures the centre joint perfectly while allowing fully adjustable feathering; a rare luxury. This is particularly beneficial on extended expeditions where you may like to adjust paddle angle to avoid repetitive strain. We experienced no degrading of the paddles over the three months despite relentless exposure to the harsh environment of strong sun and salt water (we rarely got the opportunity to rinse our paddles). The carbon fibre shaft and blades are built to endure and worked quite a beating. More importantly it has just the right amount of flex to reduce stress without compromising a smooth and powerful stroke. Tom and the team at Hennessy Hammocks have provided us with two Explorer Ultralite Asym Classics for the expedition. 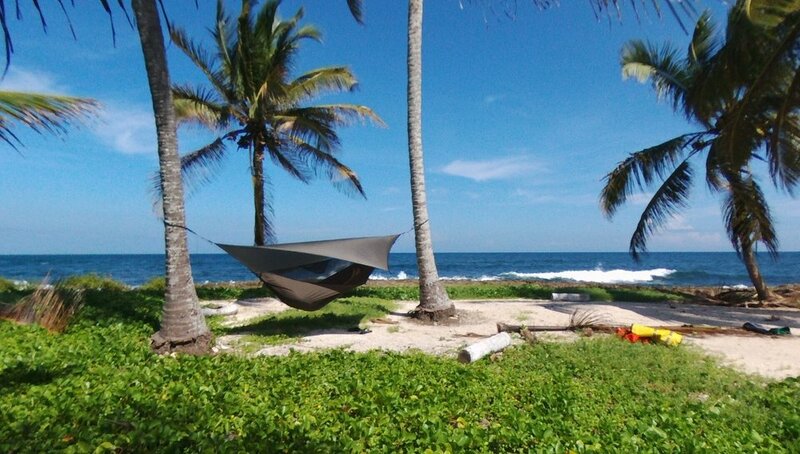 Hennessy Hammock has a complete line of specialty hammocks, including jungle hammocks, double bottom hammocks, winter hammocks, camos, ultralights, and the right size and weight for anyone up to 350 lbs. Any hammock over your height limit is going to be even more comfortable. More information coming soon. An expedition of this scale demands the most reliable equipment in terms of durability and versatile use. The Explorer Ultralite Asym Classics offered us this in buckets and along with their light weight (2.25 pounds) and small pack size we were very happy to represent Hennessy Hammocks with their kit on our expedition. If you have two trees and a couple of minutes you will be laughing with such an easy hammock. In fact, you do not even need trees (see below). The lashing Tom recommends here takes moments to master and allows the hammock to be set up quickly in any weather, day or night. 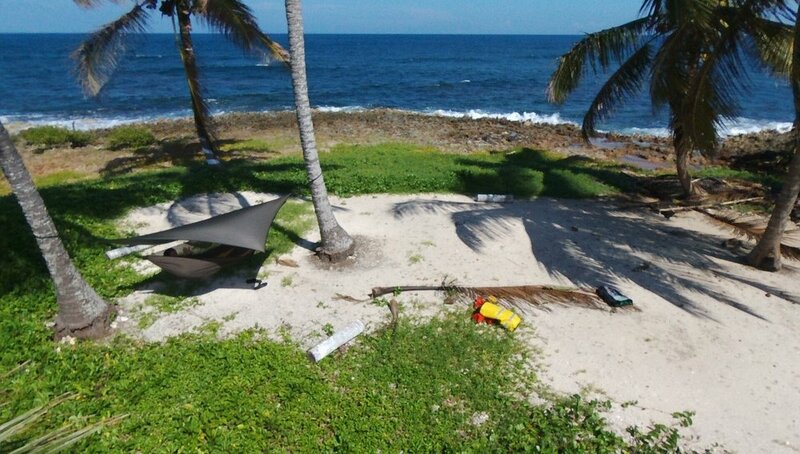 By erecting the fly sheet first you can also set up or take down the hammock in any weather without it ever getting wet. Although you can improvise with trees/local foliage I recommend packing four light weight pegs for the side tie outs and rain fly. Great. The asymmetrical design makes it easy to lie flat and get a comfortable and restorative night sleep. Room for only one.. well why would you want to share? Our model came with fitted (non-removable) bug net but is available with a zip down one side. This meant it could not be used as a chair like some other lightweight hammocks but for sleeping there is no compromise in comfort. Most important to us was the 20D polyester No-See-Um bug mesh. You cannot put a value on being able to escape the horrendous assault of tropical sand flies, mosquitoes and the rest as evening descends. When out in the jungles or on the beaches we took huge relief in retreating to our hammocks without the clouds being able to follow us. Very high quality materials and construction. After three months of use and abuse the stitching, velcro opening, No-See-um mesh and 70D nylon taffeta fabric is still solid and after using the provided polyester slings and recommended lashing technique there are no signs of ware on the ropes, which are themselves tested to 1500lbs. Assessed as the best hammock for protection from the elements by Outdoor Gear Lab and we agree. Very good protection from wind and rain; the integrated fly sheet can be rigged close to the mesh for protection from the weather and if not pulled out too wide you can lie low in the nylon fabric for additional shielding. In hot weather a gap between fly sheet and mesh allows good ventilation and prevents the condensation you would expect in most tents. Awesome. If you have two trees, or in fact any structure from which you can suspend your rig, then it doesn’t matter what the ground is like. 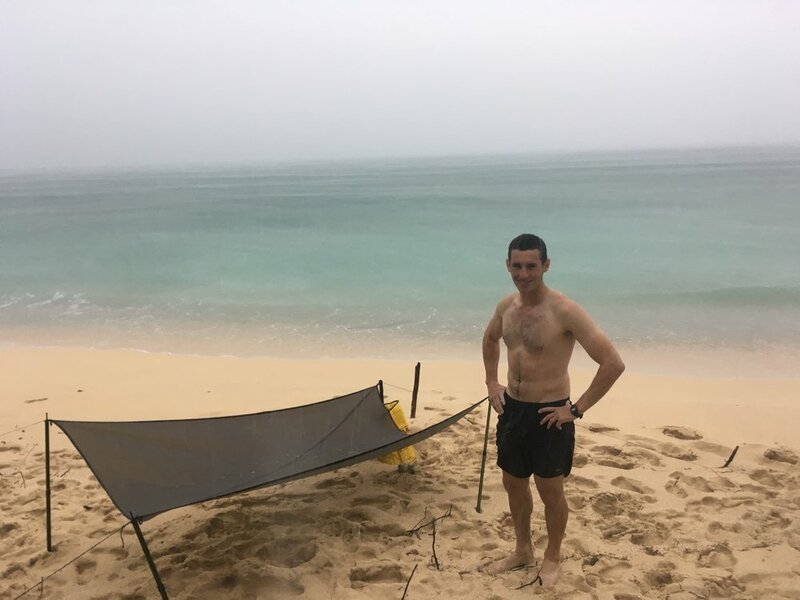 We used our hammocks over jagged rocks, marsh and sodden ground, steep jungle slopes and beaches, many of which would have been impossible to pitch a tent on. Where there are suspension points are available the hammock can still be used as a ‘tent’ while you bivvi either in the open air or under the fly sheet erected between bivvi poles or a makeshift equivalent. We will be relying on Sea to Summit Ultralight Mats to give us comfortable nights to allow our bodies to recover and ensure we start each day in the best condition possible. The ultralight sleeping mat range has has a single layer of medium resoslution Airt Sprung Cells to give you the lightest and smallest-packed volume mat without compromising comfort. These mats are ideal when going light and fast is your aim and getting a good nights sleep is essential for the next day's adventure. For an extremely light (12.5oz) and very packable warm weather design look no further; the Sea to Summit UltraLight is the best full sized mat we have used on any of our expeditions. The design is unlike most on the market, which tends to utilise horizontal or vertical baffles. Instead Sea to Summit utilise 181 air sprung cells, essentially a load of dot welds that create individual pockets between them. This creates a stable and comfortable platform that is faster to inflate than other models due to a lower internal volume – 10 big breaths is enough. While easy to inflate it is also easy to deflate with Sea to Summit’s multi function valve. Deflated it packs down to the size of a 500ml water bottle (approx.. 7.5 x 17cm) so slips easily inside a rucksack or kayak where space and weight are at a premium. The UltraLight Mat comes into it’s own in hot climates (try it’s insulated sister for cold environments) and we were very grateful for its low r rating of 0.7 to help us keep cool during the unbelievably hot and humid nights of the tropical Caribbean. The mat is also remarkably robust for it’s weight, but nevertheless comes complete with field kit of six self adhesive patches for repairing punctures in the field and a spare one-way valve flap. However, during a three month expedition in a harsh rocky, sandy and salty environment we had no need to utilise this. On the downside some people might find the bumpy surface created by the cells less comfortable than some of the flatter designs on the market and the dot welds have a tendency to collect dirt or sand. However, for it’s lightweight, small pack size and robustness we thoroughly recommend the Sea to Summit UltraLight Mat. Everything you want from a map case; fully waterproof, pliable design, and robust against harsh use. Quite frankly it does what it says on the tin. We used two large map cases (A3 size) for our charts while kayaking, putting them through their paces in the very wet, salty and sand filled environments found in the tropical Caribbean. The four anchor points on all corners allow the use of the detachable neck strap or any other mechanism such as carabiners or keyrings to provide security or hold it in place for easy access. On a kayak this allows a long string to secure the case to a kayak while not impeding use of the chart. Four velcro tabs allow the map to be folded and held in place or for the more inventive user additional tabs can be used to attach the map to a wide enough surface, including for example the deck of a kayak or a dashboard etc. Despite being lightweight the case is robust both to weather and harsh treatment, including folding, scrumpling and cramming into bags and cockpits. The PVC-free TPU material works effectively as suggested and over three months of use we experienced no cracking or discolouring. To that end the UV resistance was particularly impressive given extreme sun we exposed the cases to in the tropics. One can over-analyse a map case. Just buy this one. The X-Set 21 includes one orange 1.4L X-Pot, one blue X-Bowl, and one grey X-Mug, all weighing in at 394g and packing down to just 19.5cm diameter x 4.5cm, perfect for the solo explorer. This set is an incredibly innovative product that takes backpacking cookware to the next level. The collapsible silicone construction allows all three components to fit inside each other and pack down to just 4.5cm tall, which slides nicely into a rucksack or small storage space such as the hatch of a kayak where space is at a premium. Taking two full sets was comfortable for two people and ensured we had enough to make do if items broke during the expedition. In reality though, for two users we only required the two mugs (for brews, soups etc.) one bowl (for half the portion of food not eaten out of the 1.4L cooking pot) and one pot, which has capacity to boil enough water for two dehydrated meals. The X-Pot has a base of aircraft grade anodized aluminium and sides of food grade heat resistant silicone. This means it can only be used over a flame constrained to the aluminium underside, such as a small backpacking/camping stove, but cannot be used over an open campfire. This is perfectly acceptable for the lightweight backpacker who is the target market. We did, though, find that the silicone handles would heat up so that a cloth was needed to lift the off the heat. Cooking over an MSR Whisperlite stove with the lid on we were able to comfortably boil one litre of water within two and a half minutes, far quicker than advertised by MSR. So, what are the downsides? Well it really depends what you are after. The X-pot cannot be used on an open flame as you risk burning the silicone sides, which are heat- but not flame-resistant. The set is also slightly heavier than market competitors, however the space saving is more than worth the compromise. You may also find the silicone retains the taste of previous meals, especially when only given a field cleaned, but who doesn’t want chicken soup flavoured porridge? Most importantly the set is incredibly durable. We experienced no wear or damage over the three month expedition in an incredibly testing environment characterised by very hot, sandy and salty conditions. We were hugely impressed by the X-Set 21 and thoroughly recommend it to all lightweight enthusiasts of all disciplines. The pegs are super lightweight, hold well if placed properly and have brilliant multi-height guy points, which stop the line from slipping off the top. You even get an incredibly light Ultra-Sil peg bag with the set. The aluminium is softer than we hoped for, however if taken care of is perfectly acceptable given the weight and cost. Using the pegs in sand, rocky and root filled earth we managed the three month expedition only bending a handful of pegs. These pegs are robust enough if used appropriately and hold firm once placed. Others have not been so forgiving after they have bent the pegs here. Luckily, the set come with a life time warranty from Sea to Summit. We would like to see these pegs made in 7075 aluminium rather than the 6061 currently used. Lomo have kindly supplied us with our wish list of dry bags, which we will use for the entirety of our expedition. These will be essential to keeping our kit and equipment dry and protected from the elements allowing us to remain completely operational throughout the 3 months. Review will follow after appropriate testing during the expedition. Kayalu have kindly provided us with a Kayalite, a stern mounted kayak light to keep us safe while kayaking through the night. For safety while paddling at night we demanded a robust and effective 3600 white light to ensure we were visible to other traffic on the water. The last thing we needed was to be run down by a pleasure boat as we moved silently through the water after dark on one of our many overnight crossings. Step in Kayalu Kayalite; the only kayak light tough enough for serious after-dark kayaking, or any night time kayaking for that matter. It is strong, impact resistant and completely waterproof. The Kayalite has a soft EVA foam rubber base to grip and protect all surfaces, including glass, gel coat and teak. The mast secures to the deck by a clip that runs into the bottom of the base, up the hollow shaft and out an eyelet near the top where it is tightened and secured to a cleat on the side. This patented “Secure-Attach” system is hugely effective and can be secured to any sort of eyelet, deck rigging, carry handle etc. The Kayalite is waterproof down to 300m. We had no intention of testing it at this depth but it did endure crossings of up to 24 hours where at times every other wave surged high over the stern burying it (and me) deep in the water. It endured three months of exposure to intense tropical sun and the salty sea air – we only managed to rinse it a couple of times in that time. To see the durability of the Kayalite you must only compare it to a product advertised as similar on the market. We also took a Scotty Sea Light for the front deck. It spent the first ten days in one of our hatches. Well it moved straight from their to the bin because it had corroded and disintegrated in the salty and humid air. By comparison the Kayalite was as good on day 94 as it was on day 1! We were also very fortunate to be provided with a Kayalu suction-cup camera mount. Well, we were advised the salt water would destroy everything we took. In fact, the salt corroded and broke most go pro mounts, our Scotty Sea Light, my waterproof camera, our marine knives, strobes.. in fact almost everything electronic or with metal components. That is except for our Kayalu products. The suction-cup camera mount is a simple but completely reliable piece of gear that became essential to our efforts in documenting the expedition. All it requires is a flat surface and an eyelet, deck line or equivalent to secure it’s bungee as a backup in case the suction cup failed. Once secured the mount is very stable and difficult to shift despite being battered constantly by a powerful combination of wind and waves. The marine grade aluminium is used to create a brilliantly designed and engineered mount that is durable and versatile. The various joints make it easy to articulate into a number of positions to create interesting shots above and below the waterline. We are very grateful to C-Tug (By Railblaza) for providing us with a C-Tug kayak trolley for our overland portages and managing the kayak on the beaches. C-Tug say "It is great value for money, and will give many years of service in the sand, salt and sun of the harshest marine environments." We cannot wait to put this to the test over our three month expedition! The C Tug Sandtrakz genuinely floats your kayak over any terrain. We were thrilled to have the opportunity to test the C Tug with the new Sandtrakz wheels on our expedition. With a hefty double kayak we were loading it to its upper limit across deep sand, mud, grass and tarmac; we were not disappointed. It takes 20 seconds to put together and is just as easy to dismantle. Once broken down it fits comfortably into a kayak hatch while being easy to clean and maintain. It comes with a simple strap to secure the kayak, which can be loaded centrally, recommended for two people, or at one end, recommended if solo. Either way works well. The Sandtrakz wheels come into their own in sand where normal wheels would quickly burry themselves to a point of no return. We would have massively struggled carrying our kayak any great distance without the help of C Tug. It even featured on the Caribbean news channel down in Grenada! No inner tube and tough rubber exterior means no risk of puncture, while they compress like suspension on hard surfaces. However, the downfall of our C Tug came when we tried to turn in the sand, which resulted in the wheels digging in, and the two plates the kayak sits on both snapping. The C-Tug is specified for weights up to 80kg, which we were pushing but not exceeding. Therefore we recommend care when manoeuvring in sand along anything but a straight line. The manufacturer claims C-Tug is the “best, most versatile and durable kayak cart on the market.” We agree, but take care. The first half of our expedition is covered by charts provided by Imray Nautical Charts and Books, who also supplied us with a cruising guide to the Windward and Leeward Islands. We have spent a long time planning and plotting our route on the waterproof and tear resistant charts and look forward to testing them out in the elements. For the second half of our journey we will be navigating using charts provided by Wavey Line Charts, posted to us all the way from The Bahamas! These have been instrumental in our planning, while Jane and Bob have been fantastic and generous in offering their advice and support based on their extensive knowledge of the area. To someone who has never experience sea sickness the worry that one might become sea sick might seem minimal. However, it can been extremely serious and not something you want to experience 50 miles from land! Sea Bands kindly supplied us with some of their fantastic nausea relief Sea Bands, operated by a knitted elasticated wrist band which applies pressure on the Nei Kuan acupressure point. To someone who has never experience seasickness the worry that one might become sea sick might seem minimal. However, it can been extremely serious and not something you want to experience 50 miles from land! Sea Bands kindly supplied us with some of their fantastic nausea relief Sea Bands, operated by a knitted elasticated wristband which applies pressure on the Nei Kuan acupressure point. The Sea Bands were great; a comfortable fit and couldn’t be simpler. All we needed to do was make sure they were on our wrist! Operationally neither of us experience seasickness in conditions that we would have definitely expected to. We were extremely impressed. Shark Banz have supplied us with two of their shark deterring bands for peace of mind if we end up in the water while kayaking in the shark infested waters of the Caribbean. Let's hope they work! The Caribbean Sea is known for having Caribbean reef sharks, Blacktip reef sharks, Tiger sharks, Nurse sharks, Bull sharks and Great White Sharks just off the coast of Miami. We were very pleased to have our Sharkbanz on our wrists, especially when going through the Bahamas and across to Miami. Although we had encounters with sharks we were at no point ‘bumped’ or threatened by the sharks. An unidentified shark did follow the boat in the Bahamas but quickly moved on. It is difficult to know if the sharks were disinterested by the 22ft kayak or the sharkbanz were very effective. All in all we were very grateful to have the Sharkbanz on our wrists, especially when kayaking through areas such as ‘Shark Alley’ at night. Falcon Sails have kindly offered a considerably discounted kayak sail and a bunch of free upgrades for our use on the expedition. The 1.3 square meter sail will help us maintain speed over our 36 hour crossings and provide an extra form of propulsion in an emergency situation where getting straight to land is the priority. 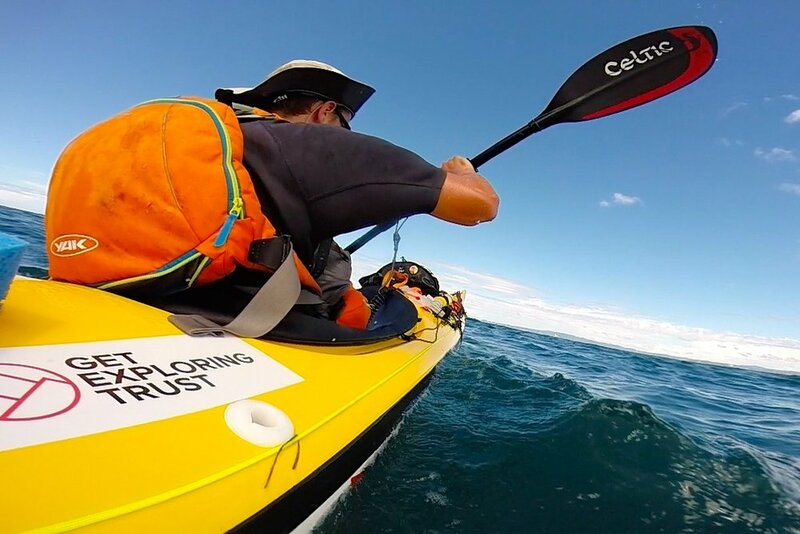 Setting off on this 2000 miles kayak was always going to be a daunting task. With just a week of sea kayaking experience between us we were certainly wary of the steep learning curve to come. Although we both had sailing experience we had no idea how the falcon sail would perform and what kayak sailing would be like. To say the least we were absolutely thrilled with its performance. Credit must go to our fantastic Seaward Passat but the falcon sail did not compromise our stability in any way. Although we experienced constant headwinds for the majority of the first half of the trip, we were certainly able to use our sail as the winds changed direction for the last half of the trip. The sail operates extremely well in strong winds; we were able to reach speeds of up to 6-7 knots on occasions. On the calmer days, if the wind was behind us, we would still be able to add an extra knot to our progress. For 16/17-hour days the difference between 3 or 4 knots is absolutely huge and we really do have the Falcon Sail to thank for that! The sail is very efficient. It packs down very neatly to the side of the boat when not in use and is also very quick and easy to put the sail up when the wind picks up. The Falcon sail website states that ‘With a Falcon Sail, you have the potential to gain an advantage when paddle sailing up to 30 degrees off straight up wind.’ It’s certainly true. We were wary to not be pushed leeward by the wind when sailing on a beam reach or higher but by frequently checking our progress on the GPS we were able to factor in any cross movement and continue at a good speed. Over 3 months we experienced very few technical problems with our sail. Bearing in mind that we were very rarely able to clean or maintain it, we were very impressed. Moreover, when we did have a technical problem (largely due to our own fault) Patrick Forrester, the president of Falcon Sails, was immediately on hand late at night to assist us to get everything up and running for the next day. From what I gather he was even at the theatre with his wife but was able to give us multiple solutions from just a few dark pictures! We are so grateful for their sponsorship and all their help towards our expedition. 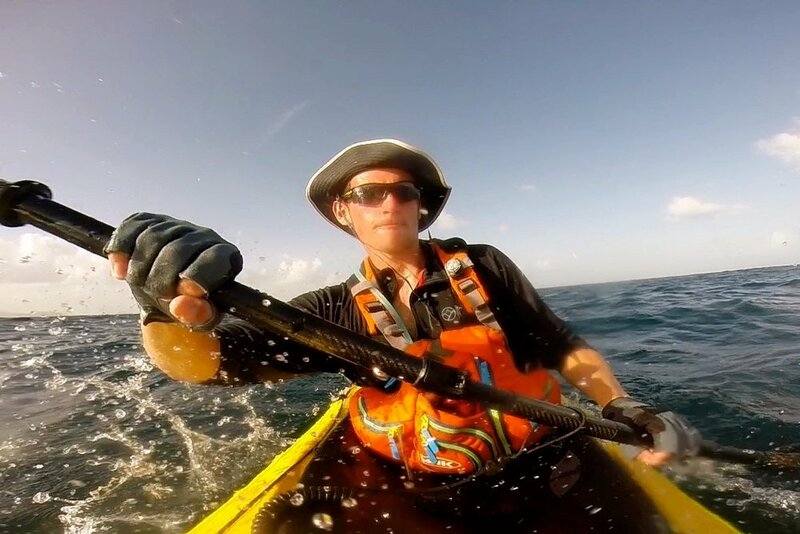 Kayak sails in these big expeditions are no longer an optional extra but fundamental to ocean kayaking. We definitely had times when we really needed the support of our sail, dashing to land on a few occasions. We would thoroughly recommend a Falcon sail to anyone looking to get involved and give it a go. Extreme Adventure Foods is a British company that specialises in the design and manufacture of unique nutritional products, including the high calorie dehydrated meals and snacks we used on sections of the expedition. We are very grateful for the huge discount they offered us as we stockpiled high on flapjacks and powdered shepherds pie. Extreme Adventure Foods supplied us with a mixture of 800Kcal Extreme meals, Extreme 4:1 Electrolyte & Protein Recovery drink powders, Clif energy bars and 440kcal high energy chocolate chip flapjacks. They Extreme meals taste great, they were brilliant for providing enough energy and were lightweight enough to pack into our kayak. Simply adding boiling water produced a warm meal 6 minutes later. Extreme 4:1 Electrolyte & Protein Recovery drink powders: Simply adding these Electrolyte powders to 600ml of water provided a fast Endurance drink that certainly provided noticeable energy in important times. They were our go to drink to keep the energy levels high in the difficult times. They also made for a great recovery drink after a very long day on the water. The energy bars we were provided with were simple but very effective. They were perfect for a quick snack on the water when we had very little time to stop and rest. Not only providing a great energy boost but also suitable calories to keep our energy consumption on track for the day. They were leightweight and faired well in the heat.